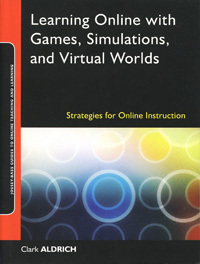 Learning Online with Games, Simulations, and Virtual Worlds: Strategies for Online Instruction is a book by Clark Aldrich, an educational game consultant, which explains the benefits of different types of games, and contains suggested models for instruction. It is intended mainly for teachers and curriculum designers, but could also function as a good introduction to educational games for any interested layperson. It focuses on the preparatory work required to successfully implement educational games in a learning environment, and how to maximize their benefits for students and teachers. The book does more than just describe educational games and argue for their usage. It shows the reader how to identify opportunities for building games, use best practices, and outlines specific steps for developing, preparing, and designing game-oriented instruction. There are three parts to this book. Part 1 argues for the use of games in education, and posits that virtual environments are actually a natural part of human thinking. Research and studies are referenced, demonstrating the effectiveness of games in education, and showing quite clearly how and why they work. Different types of interactive learning activities are defined, and divided into three primary categories: games, simulations, and virtual worlds. Games are simpler activities that are meant to be engaging and encourage awareness, while simulations focus more on skill-building. Educational simulations are “structured environments, abstracted from some specific real-life activity, with stated levels and goals” (p. 7). Virtual worlds are “3-D environments where participants from different locations can meet with each other at the same time” (p. 8). Virtual worlds are noted for their detailed interactive models and real-time collaborative learning environment. Visual cues can play a part in virtual world learning, whereas they may not in the other types of interactive learning activities. These different types of activities are not mutually exclusive; there may be overlap among their components. Different types of simulations are broken down into several genres, and the author does a great job classifying the different aspects of games and levels of interaction. The real meat of the book is in Part 2, which describes how to put highly interactive content into practice. These interactive learning activities are referred to as “Highly Interactive Virtual Environments” (HIVEs). The book mentions stumbling blocks that may be encountered from both students and teachers, and how to overcome them. Detailed steps are provided on how to use HIVEs, including preparing instructional material, obtaining technical support, how to build them or recruit others (such as students) to build the content, and how to determine the best courses of action. The book has a heavy focus on Second Life, and most of the discussion of virtual worlds directly references how to plan and accomplish tasks in Second Life. A lot of the tasks described are often best suited for a higher education environment, so someone in the K-12 field will naturally have to read through the filter of their own unique student safety and appropriate use policies. A hypothetical setup and process for engaging students in a sim is described, with information about game interfaces, how to draw everyone in, setting the tone, determining learning objectives and outcomes, how to determine appropriate coaching during use, and the value of including competition as a game element to trigger motivation. The author also discusses how to deal with disinterested and frustrated students, and emphasizes the importance of tying the sim to real life. Of course, knowing all this information about HIVEs is meaningless if you can’t convince your stakeholders that they’re worthwhile. Part 3 contains some much-appreciated and much-needed tactics for convincing administrators, parents, and politicians of the value of HIVEs. The author points out that advocating HIVEs requires that we don’t defend them blindly, but evolve them intelligently. Many people have the misconception that games “dumb down” learning material, simplifying it to a point that entertainment comes before usefulness. We must be able to demonstrate exactly how and why simulations can enrich, rather than flatten content. The author also spends a good deal of time discussing methods for evaluating instruction in the simulations. In fact, an entire chapter is dedicated to this topic, with references to it throughout the entire book. The psychomotor skills that are often learned through sims can’t be measured through a multiple choice post-test. This is where formative evaluation comes in handy. The book is shorter than one might expect, but it’s packed with information, and written concisely and informatively. The author gets right to the point. The main concepts are not over-simplified, and there’s a lot of detail specifically about how to approach different types of learning in HIVEs. The author drove home a good point for me: The goal is not to just recreate the classroom in a virtual world environment, but to provide an extension of the classroom that uses the virtual world’s advantages. After reading this, my thoughts on virtual worlds have changed. I used to think that virtual worlds were just a good way to increase student engagement. Students like games, so naturally many of them would become more involved in the learning process if games were used, right? Well, it’s a lot more than that. There are times when an educational game, simulation, or virtual world is THE best form of instruction. What this book attempts to do is equip the reader with enough tools to recognize WHEN a game, simulation, or virtual world is the best form of instruction, and I think it does a good job of this. Aldrich, C. (2009). Learning online with games, simulations, and virtual worlds: Strategies for online instruction. San Francisco, CA: Jossey-Bass.